The upcoming Normandy Jump commemorating the 75th anniversary of D-Day, new standards for obtaining an Airline Transport Pilot certificate or an airplane type rating, a solid-state propulsion system from MIT, and a carbon offsetting and reduction scheme for international aviation. CJ Machado is a writer, a photojournalist with Homeland Magazine, and an illustrator. She is founder/CEO producer of Love Amazingly Productions and devotes all her projects to humanitarian causes and veteran advocacy. One of those projects is Normandy Jump 2019. CJ getting her pin after jump school from 93-year-old Vincent Speranza, WWII “Battle of the Bulge” and “Screaming Eagle” 101st Airborne veteran. 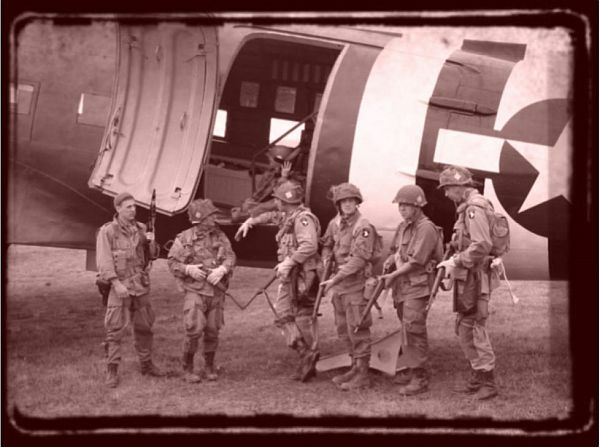 To commemorate the 75th anniversary of D-Day and the invasion of Normandy, an estimated 25 countries and dozens of vintage aircraft, mainly C-47’s, will participate including the Commemorative Air Force’s D-Day Doll and lead aircraft of “Operation Overlord,” That’s all Brother. Hundreds of paratroopers and civilian parachutists, as well as members of the 82nd Airborne, will fly across the English Channel and jump in the historic drop zones of Normandy as they did 75 years ago. Everyone will be dressed in WWII style allied uniforms and will jump with military round parachutes. Love Amazingly Productions and Speed and Angels Productions are producing a documentary film about this event. In order to participate, CJ had to attend and document the same jump training as the parachutists, and she tells us about that experience. 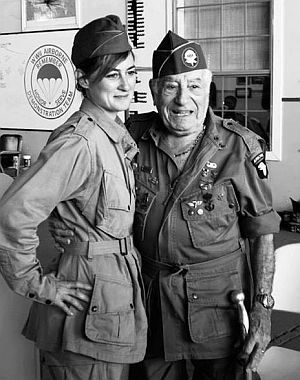 Her jump school was conducted by the WWII Airborne Demonstration Team and her pinning ceremony was quite remarkable. The Normandy Jump 2019 documentary will include interviews and rare footage of the WWII veterans that fought on D-Day and the team will follow and film D-Day Doll on her mission back to Normandy with much-anticipated stops at the National Museum of the United States Air Force in Ohio and the Waterbury-Oxford Airport in Connecticut, where American aircraft will convene before they cross the Atlantic. For more information and to support the documentation of Normandy Jump 2019, please visit NormandyJump2019.com and consider pre-ordering a Normandy Jump 2019 DVD. 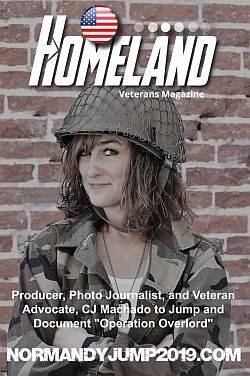 CJ Machado on the cover of Homeland Magazine. See CJ’s Homeland Magazine article, Airborne all the Way about D-Day Doll and the WWII Airborne Demonstration Team at the Planes Of Fame Air Show in Chino, California. Inland Empire Wing is a wing of the Commemorative Air Force which has as it’s mission education such that generations of Americans will value and support the contributions of military aviation to assure the nation’s freedom. In 2019, the D-Day Doll will journey back to Normandy, as the world celebrates a day of infamy, the 75th Anniversary of D-Day. Five men will climb into an old warbird and fly her back to the mission field once more. Listen to Airplane Geeks Episode 503 D-Day Squadron and the C-47 with guest Moreno “Mo” Aguiari, Executive Director of D-Day Squadron, an organization that plans to lead an American fleet of historic, restored C-47 World War II military aircraft in Daks Over Normandy in June 2019. Reading PA WWII Weekend 2012. Photo by David Vanderhoof. The FAA is proposing new standards for obtaining an Airline Transport Pilot (ATP) certificate in the airplane category or for obtaining an airplane type rating. Submit your comments at Airline Transport Pilot and Type Rating for Airplane Airman Certification Standards by December 21, 2018. 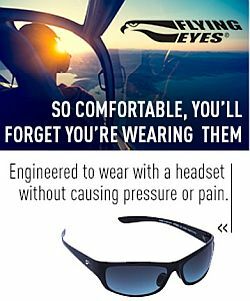 The proposed change includes preparation for the FAA ATP knowledge test and practical test and to receive an ATP certificate or airplane type rating. MIT has demonstrated a solid-state propulsion system that can sustain powered flight, by designing and flying an electroaerodynamically propelled heavier-than-air aeroplane. See Flight of an aeroplane with solid-state propulsion published November 21, 2018 in Nature. The UN Agreement, Carbon Offsetting and Reduction Scheme for International Aviation (CORSIA) would require that by 2021, participating airlines that fly internationally will have to offset any extra emissions. See Assembly Resolution A39-3. This entry was posted in Episodes and tagged carbon offsets, D-Day Doll, Daks over Normandy, FAA, mili, MIT, Normandy on November 28, 2018 by maxflight.